The injector accumulates vacuum to 29.75 inches Hg.extracting the air pockets from the break cavity and applying pressure to the resin for penetration. This deluxe system is made to accommodate businesses requiring equipment and supplies to handle higher volumes of windshield repair work and specialized glass services. Replacement UV bulb for B80 & Shop Lamps (4 watt, 6 inches long). 12 Volt Drill (12,000 Rpm) with Cigarette Lighter connection and 2 drill bits. Battery Connector for GD18 Drill. Clip with Suction Cup for mounting B80 Lamp to Glass. 5 Carbide Drill Bits (1/16 shaft/hole size .035). Mandrel with polishing felt tip. 30” length Hose with connectors. Flow Regulator (Controls Resin flow into Break Cavity). Carbide tip (for cleaning loose glass from impact point). Red Plastic Tool Box (19 X 9 X 9). Available free with kit. Plastic Tool Box (16 X 8 X 9). Available free with kit. 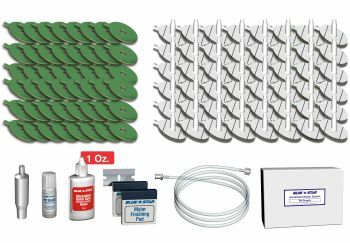 20 resin applicators (3”) for applying crack resin to surface cracks. 25 Adhesive Alignment Seals (Double Sided Adhesive Seals). 25 Pedestal Resin Chambers for Clear Vac (Resin Chambers with Mounted Seals).